Concert featuring songs and music taken from the films and TV work of David Lynch and composer Angelo Badalementi. Contributors include alternating members of Tindersticks, Savages, plus Mick Harvey, Cibo Matto, Stealing Sheep, Sophia Brous, Kirin J Callinan, Terry Edwards, Seb Rochford and more. 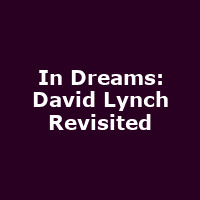 "In Dreams immerses the audience into the mood and atmosphere of Lynch's universe, with landmark instrumental tracks and exciting new versions of songs from his films, performed by a superb band assembled and led by musical director David Coulter."